Wayne is originally from Cleburne, Texas and has been a life-long North Texas resident. Wayne started with MedStar in 2007 as a technician in our logistics department and quickly rose to department supervisor. patient care reporting, and computer aided dispatch system. Wayne is very excited about his trip to Washington, D.C., to meet other Stars from across the industry, and because this will be his first ever trip to Washington. 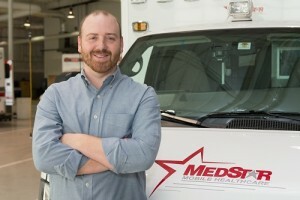 He will be joined by his wife, Shauna, who is also a MedStar employee working in our business office. Wayne and Shauna met while working at MedStar.